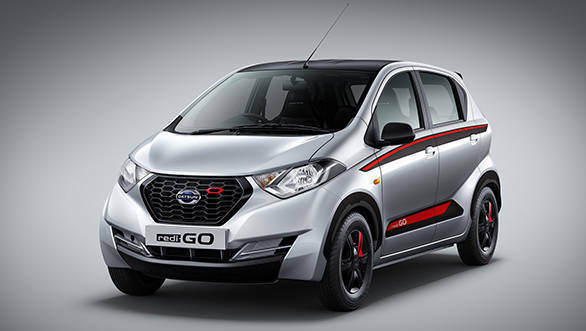 Datsun has launched the limited edition rediGO in India at Rs 3.58 lakh for the 0.8L manual transmission version and Rs 3.85 lakh for the 1.0L manual transmission models that will be available in three colors - white, silver and red at all Nissan and Datsun dealerships in India. The limited edition gets cosmetic updates over the regular model. Mechanically, both these models remain unchanged. The 2018 Datsun redi-GO limited edition comes equipped with roof wrap, body graphics and front-rear bumper undercovers. In addition, the hatch gets a front signature red insert on grille and rear tailgate graphics. The interiors of the redi-GO limited edition gets red and black leather upholstery seats with red accents on the AC vents, rear parking assist sensor with distance display device, satin chrome gear bezel, chrome inside door handles and carpet mats.